BLUEBURYme - The (short but joyful) Story! sometimes in life you happen to be at the right place at the right time. springtime 2004: vrony and LAUTh meet at the buffet of the austrian music awards. nice buffet indeed! they know each other for quite a while - surprise - they're on tour with different bands and they're working musicians in austrias musicscene. (yes - its small but great - check it out!) so what - vrony's got a few songs and needs more - LAUTh has them. 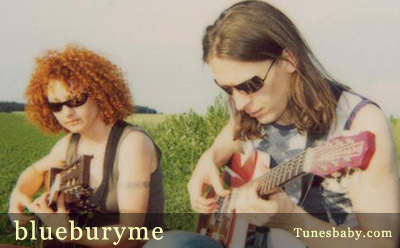 after a trial rehearsal BLUEBURYme is born! inspired by great rehearsal sessions new songs grow and half a year later BBme is ready for a studio session - 4 days of recording - 'songs for a sunday afternoon' - it was great fun - and you can hear that! august 2004: clint farmer's joining. he likes the music - and has ideas for visual delights! enjoy the BBme-artwork by clint farmer - the man with the eye (www.farmersbest.at) check out our great website with a good look, nice pics, a game....... and of course new songs!